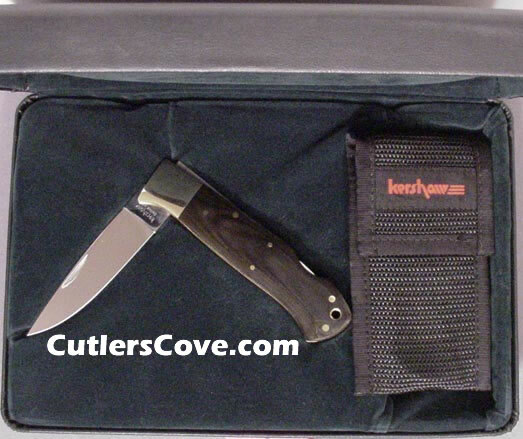 Kershaw 1993 Limited Edition with black micarta handles and brass bolster, mint in the original Kershaw presentation box with sheath. It is 4-1/4" closed and a good looking knife with lanyard hole. We called Kershaw and they do not know how many were made but not very many, maybe limited to 600 pieces back in 1993. It had a list price of $275.00 back years ago, according to Kershaw. The company was started in 1974 by Pete Kershaw. Produced before Pete Kershaw retired on May 31, 1998.